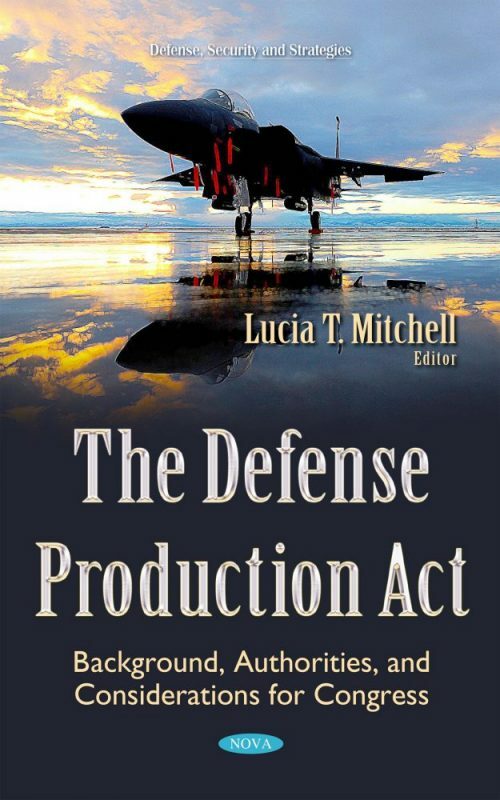 The Defense Production Act (DPA) of 1950, as amended, confers upon the President a broad set of authorities to influence domestic industry in the interest of national defense. The authorities can be used across the federal government to shape the domestic industrial base so that, when called upon, it is capable of providing essential materials and goods needed for the national defense. Congress has expanded the term national defense, as defined in the DPA, so that it now includes activities related to homeland security and domestic emergency management. The scope of DPA authorities extends beyond shaping U.S. military preparedness and capabilities, as the authorities may also be used to enhance and support domestic preparedness, response, and recovery from natural hazards, terrorist attacks, and other national emergencies. This book examines some of the extensive history of the DPA, focusing primarily on its creation and most recent legislative reauthorization. This book also discusses the foremost active authorities of the DPA; explains how those authorities may have changed as a result of the most recent reauthorization of the law; identifies relevant delegations of the President’s DPA authorities made in Executive Order; provides a brief overview of issues Congress may wish to consider in its oversight of executive branch use of DPA authorities, as well as the implementation of changes made in the most recent reauthorization; and discusses congressional considerations for expanding, restricting, or otherwise modifying the authorities provided by the DPA through new legislation. Statement of Frank Kendall, Under Secretary for Acquisition, Technology, and Logistics, U.S. Department of Defense. Hearing on "Oversight of the Defense Production Act: Issues and Opportunities for Reauthorization"
Statement of Eric L. Hirschhorn, Under Secretary for Industry and Security, U.S. Department of Commerce. Hearing on "Oversight of the Defense Production Act: Issues and Opportunities for Reauthorization"
Statement of Richard Serino, Deputy Administrator, Federal Emergency Management Agency. Hearing on "Oversight of the Defense Production Act: Issues and Opportunities for Reauthorization"